This fascinating 4 and a half mile walk begins at the tiny hamlet of Twelveheads, 6 miles from Falmouth, and takes you into the heart of the Gwennap Parish, the major copper producing area of Cornwall, which in the late 18th and early 19th centuries was said to be the richest square mile on earth. Intensively mined, it is estimated that there were over 3000 mine shafts in this area, although little evidence remains now, apart from a few capped shafts and a handful of derelict engine houses. Twelveheads lies in the Chacewater Parish, another great mining district, and gets its name from the battery of stamps, with twelve heads, which once worked in a dressing floor in the village. It is also the location of the portal of the Great County Adit, that once drained all the mines in the locality. Very clear directions for this short walk can be downloaded from the iWalk Cornwall website. The route takes you to the area worked by the Great Consolidated Mine (Consuls), the largest single producer of copper in Cornwall and the richest copper mine in the world in its heyday, and down to the Poldice Valley and the ruins of the arsenic workings at the Poldice Mine, before leading back to Twelveheads on the Coast to Coast Mining Trail. In its lifetime Consuls produced over a million tonnes of copper ore and worked down to 538 m below the surface. In 1836 the mine employed 1730 men, 896 women and 597 children as young as the age of 8. Conditions were grim to say the least. The water in the mine was acidic and the air was often thick with blasting fumes. Some of the lower workings were extremely hot; the air temperature at the 294 fathom (538 m) level was recorded at 36°C, increasing to 42°C in places, and the water at the bottom of one of the shafts reached 33.6°C, the men working in the lower levels using this to cool themselves! Drenched in sweat and exhausted at the end of a long shift, the men and boys then had to climb up to surface (or "grass") by ladders. What it must have been like to descend and ascend these ladders is detailed in the posting of 13th August 2015. The novelist William Beckford visited the area in 1787 and wrote "At every step one stumbles upon ladders that lead into utter darkness or funnels that exhale warm copperous vapours. All around these openings the ore is piled up in heaps ready for purchasers. I saw it drawn reeking out of the mine by the help of a machine called a whim put in motion by mules, which in their turn are stimulated by impish children hanging over the poor brutes and flogging them without respite. The dismal scene of whims, suffering mules and hillocks of cinders, extends for miles. Huge iron engines creaking and groaning, invented by Watt, and tall chimneys smoking and flaming, that seem to belong to Old Nicholas's abode, diversify the prospect. The miners who crawl out of the dark fissures are woeful figures in tattered garments with pickaxes on their shoulders, while the mine officials regale upon beef, pudding and brandy." Consolidated Mines was formed in 1782 by the amalgamation of a number of neighbouring mines including Wheal Girl, West Wheal Virgin, Wheal Virgin, Wheal Maid, Wheal Fortune and Carharrack Mine. The underground workings of these mines were interconnected, and before the merger they had major problems with underground water. They were jointly running seven Newcomen engines to pump water from their workings into the Great County Adit but the engines had been struggling to keep the water levels down and were so expensive to run that all the mines closed in 1779. The end of the 18th century was a difficult time for Cornish copper mines, as the vast quantity of ore that was being mined cheaply from Parys Mountain in Wales was flooding the market, and Consuls closed in about 1805. However the Parys Mountain ore was exhausted by about 1800, and the price of copper soon rose again but it was not until 1819 that mining entrepreneur John Taylor raised the capital to restart Consuls. The mine rapidly became profitable, but its problem with underground water continued, and between 1819 and 1840 over 60 miles of adits, stopes and shafts had been excavated, and the workings drained by 10 massive Boulton and Watt pumping engines lifting water into the County Adit. The only one of these mighty pumping engine houses still surviving is at Wheal Virgin, and it is one of the oldest surviving engine houses in Cornwall, dating back to 1826. Steam to drive the giant engine was provided by four Cornish boilers burning around 1500 tons of coal every year. It is worth the steep climb up to the ruined engine house, for the fine view of the mountains of old spoil heaps, where, due to the high arsenic content, there is very little vegetation. The shaft of the Wheal Virgin pumping engine is open, and covered only by a metal grid. Drop a stone down to adit level about 120 m below, and the echo of the splash is bone-chilling! Prominent in the lunar landscape of old dumps below is the Wheal Maid tailings lagoon. Between 1976 and 1978 Cornwall Tin and Mining Ltd disposed its mill tailings here from the nearby Mount Wellington tin mine, which closed in 1978 due to that great enemy- water. Billiton Minerals purchased the Mount Wellington mill in 1979 and until 1981 reprocessed the tailings and other dumps in the Carnon Valley, the tailings being pumped into a separate Wheal Maid dam upstream of the first. Mount Wellington finally ceased all operations in 1981. The success of Consuls led the owners of the port at Portreath, from where ore was transported to the smelter in Wales, and coal brought back from the Welsh coalfields, to increase their charges, so in 1824 John Taylor built the Redruth and Chacewater Railway to transport the ore from this mine (and other ones nearby) to the port of Devoran. The two tramways now form the Coast to Coast Mining Trail from Portreath to Devoran, and on some of the paths the remains of the early horse-drawn tramway are still evident by the original granite setts that the tramroad used to run on, rather like early railway sleepers. During its relatively short life, Consols was a phenomenally productive copper mine; between 1819 and 1858 it produced 442,493 tons of ore, the largest quantity from any single mine in Cornwall. By the 1850s it was clear that the copper mines in the west of Cornwall were becoming exhausted and this together with the start of foreign production, particularly from Chile, led to a spate of closures or further mergers to reduce running costs. Consolidated Mines ceased working in 1857. In the nearby Camborne-Redruth district, rich deposits of tin were found below the copper. In Gwennap no such deposits were found and when low prices caused the collapse of the copper market in the 1860s, many mines were forced to close or amalgamate. 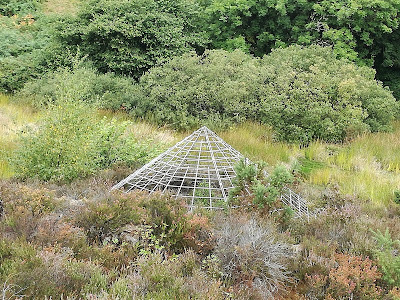 Continuing the walk from the tailings lagoons and through the village of Crofthandy takes us to the ruins of the arsenic works of the Poldice Mine, described in detail in the posting of 4th October . From the Poldice Valley, the return to Twelveheads is an easy walk via the Coast to Coast Mining Trail. I very much enjoyed this historical account which I read today, especially regarding Gwennap where my family had roots some 5 generations ago before my great grandfather migrated to Australia. Those roots likely go back much earlier as I now realize (thanks to Ancestry.ca) that I share a significant amount of genetic overlap with current residents of the Redruth district. More on the history of mining and mineral processing in Cornwall (or elsewhere) will always be appreciated by this reader. Thank you Barry.